A QR-code dog tag has laser etched QR-code on one side. When a smartphone scans the QR-code, it displays the pet owner’s contact information. If the smartphone is GPS-enabled, then the pet’s owner is alerted by text message the location at which the QR-code pet tag was scanned. This article describes how to make a QR-code pet tag, where to buy a QR-coded pet tag with hosting service, and how QR-code pet tags compare to a pet microchip. 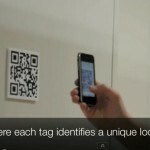 What is a QR code Dog Tag? Finally, Fido has his own mobile-friendly web page! A QR-code enabled dog tag works this way: The dog tag includes a durable, laser engraved QR-code on one side. When the pet’s QR-code is scanned by a scanning application on an iPhone, Android phone, or any smartphone, a mobile friendly web page is displayed with the owner’s contact information. The site may also contain any special handing or medical information for the pet. 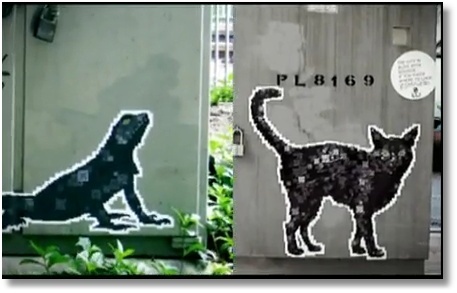 If the smartphone used to scan the code is GPS enabled then the pet’s owner is immediately alerted by text message of the geographic location where the QR-code was scanned. Pet shelters and animal control facilities routinely scan pets for a pet microchip but most don’t yet scan QR-codes. QR-code pet tags usually have recurring annual fees but pet microchips are registered online once and have no recurring fees. 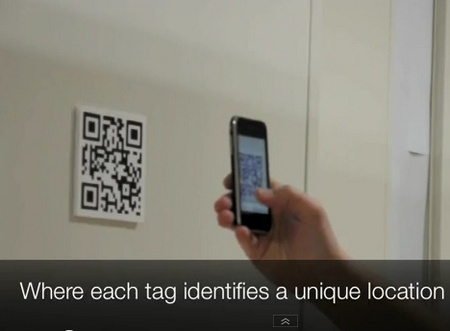 You can use any QR-code Generator to create free QR-code artwork for a pet tag. When you generate a QR-code for a pet tag, you can choose between QR-code content that requires an Internet connection, QR-code content that doesn’t require an internet connection. 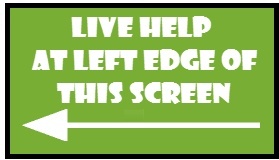 Most consumer QR-codes displayed in magazines or on signs require an internet connection because they link to Internet websites. However, you can generate a text or vCard QR-code that contains contact information or text which doesn’t require an internet connection. The disadvantage of the text or vCard choice is that the pet owner has no way of knowing when a non-internet QR-code is scanned. QR-code style: WebPage URL — Use this style to generate a pet tag QR-code that links to a simple web page you create on your host (or a URL that links to one of the pet registration services listed in the next section). Remember, if you make a simple pet web page, it doesn’t need much information beyond the owner’s contact information and special instructions. Any tag with a QR-code should also include a short text version of the target URL so that people who have access to the Internet but don’t know how to scan a QR-code can still access your pet’s web page. Tip: Use a URL redirector or shortener to make the text version of the URL easier to fit on a pet tag and so that the QR-code is less visually complex and more readable. QR-code style: vCard or Text — Use either of these styles to generate a pet tag QR-code that doesn’t require an internet connection because the information is completely contained in the QR-code. When you select vCard or text as a QR-code style, the QR-code generator form will display appropriate fields for the text to be contained in the QR-code. 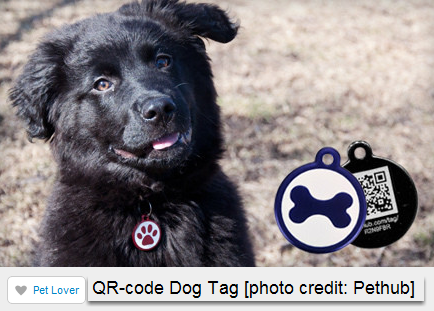 Once you’ve created your QR-code image, you can upload the image to the DogTagArt website where a durable pet tag will be manufactured and mailed to you. When you receive the pet tag, be sure to confirm it works properly with your smartphone scanner app before placing it on your pet. 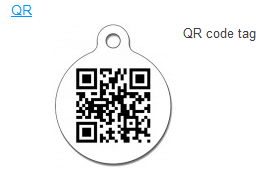 DogTagArt.com sells laser etched, stainless steel QR-code pet tags for about $12. You can create your own QR-code image and upload it to their site. Red Dingo sells enamel and stainless steel QR-code pet tags in retail pet stores and at the PetHub website for about $16 . The QR-code on a RedDingo tag must link to a PetHub pet profile (it can’t link to your personal website). QR-code Pet Tag Online Pet Registration: Both companies provides a unique website for the pet that is displayed when the pet’s QR-code tag is scanned. Virtual Leash subscription prices range from free to $89 depending on the number of contacts to be notified and the type of notification methods desired. PetHub subscription prices range from from free to $49 per year. The premium subscription includes GPS notification and multiple contact methods. How Much to Microchip a Dog? 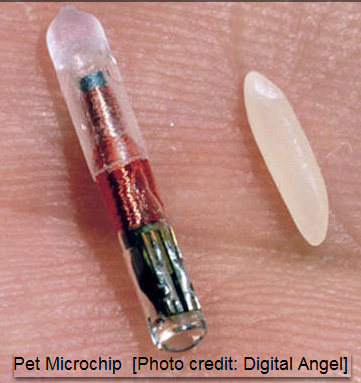 Pet microchips are not much larger than a grain of rice and can be gently inserted under the skin of dogs, cats, birds, reptiles and other pets. Each pet microchip has a unique number, and this number is matched to an online database that includes the name and contact information of a pet’s owner. Some cities, such as El Paso, Texas, have begun requiring owners to microchip dogs, cats and ferrets [source: City of El Paso, Texas]. In the U.S. about 130 million dogs and cats (about 5% of the U.S. pet population) are microchipped [source: Springen, USDA]. Pet microchips are much more popular in Europe where about a quarter of all pets have microchips. Estimated Cost to Microchip a Dog [Source: Yahoo Answers]: Between $10 and $100 to insert the pet’s microchip and register the pet in an online database. How to find a local Dog Microchip service: Use Google to search for “Pet Microchips” in your city. For example, search for “Pet Microchips Boulder CO” or “Pet Microchips Chicago IL” Most veterinarians will microchip your pet, but you may find lower prices for microchipping your pet at your local humane society or pet shelter. 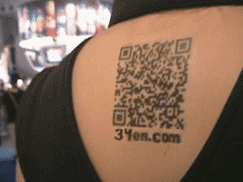 Summary: QR codes can be produced as both temporary tattoos and permanent tattoos. Here’s how. 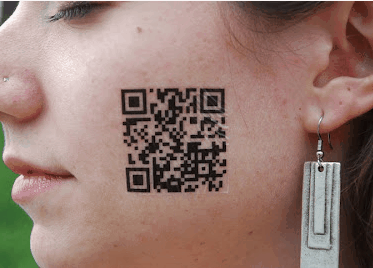 In Spring 2010, Dave’s Bread of Seattle gave away free QR Code Temporary tattoos to attendees that when applied to skin can be snapped with a smartphone’s camera to reveal that they won a tee shirt, a baked good, or a grand prize bag. An important lesson about the QR Code Temporary tattoo is that it had a “Call to Action.” That is, the promise of a prize compelled the recipients of the temporary tattoo decals to apply them — and for others to scan them. Marketers must give prospects a good reason to scan a QR code. Remember the demographics of your prospects. 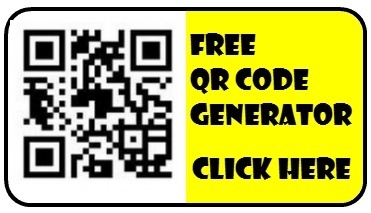 A QR-code promotion will work well for prospects with smartphones and QR code scanner apps, but won’t work well for a prospects that use phones exclusively for phone calls. 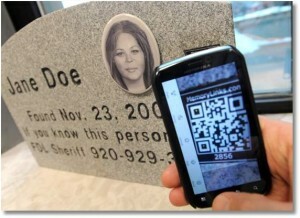 Summary: The gravestone for a murder victim includes a QR code that can be scanned for information and photos about the murder victim and contact information for the Sheriff’s office. In Fond Du Lack County, Wisconsin, Some families are using QR codes in headstones to extend the remembrance of a loved one. In this case detectives have incorporated a QR code into the headstone of a young woman to help cultivate tips about her murder. The headstone includes an image of the unknown woman and a QR code. 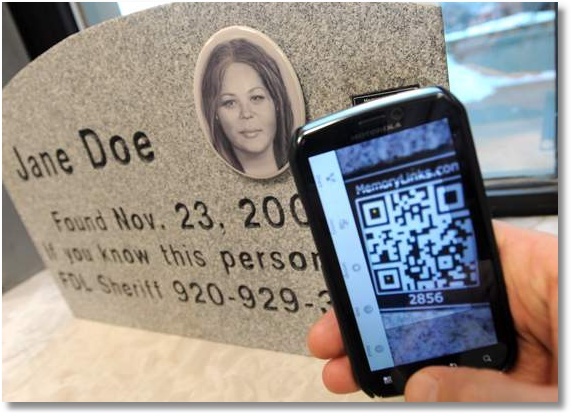 When someone scans the QR code on the marker, a site is displayed on their smartphone that contains information about the woman and contact information for the Sheriff’s office. Summary: How to add a QR code to a grave as described by a Memorial stone maker in Japan. Memorial stone maker Ishinokoe (Voice of the Stone) of Yamanashi Prefecture produces grave stones with QR codes embedded in them. They are called the concept Kuyou no Mado, loosely translated meaning “Memorial Service Window.” Visitors to the memorials can scan the QR code with a mobile phone to view information about the deceased. The website may include pictures, video, or other family information. Continue reading to learn the details and see pictures…. Summary: How to use QR Code Calibration for ‘Mobile Augmented Reality’ to calibrate the location of mobile devices when GPS isn’t available. Designed by a A Kyushu University student. What is QR Code Calibration? QR code calibration could be used by a museum wanting to provide QR code augmented video to visitors when they view objects on their smart phone screens. Or it could be used by tour agencies to provided augmented video to visitors on tours. QR code calibration is most useful if the mobile device doesn’t have built in GPS. Also, QR code calibration is useful when GPS location is inaccurate or is out of range of GPS transmitters. QR code calibration for mobile augmented reality was demonstrated in a graduate project by a Kyushu University student in 2011.